My son, Jordan, played the drums like a man possessed…. ….possessed by the Holy Spirit. Below are two pics. The second pic is of the members of his rock band: Alexander Gates, Johnny Olvera, and Cory Morrow. They rehearsed in our basement. I swear on everything holy…..the floor vibrated underneath our feet – and Michelle & I wouldn’t have had it any other way. These boys are like sons to us. 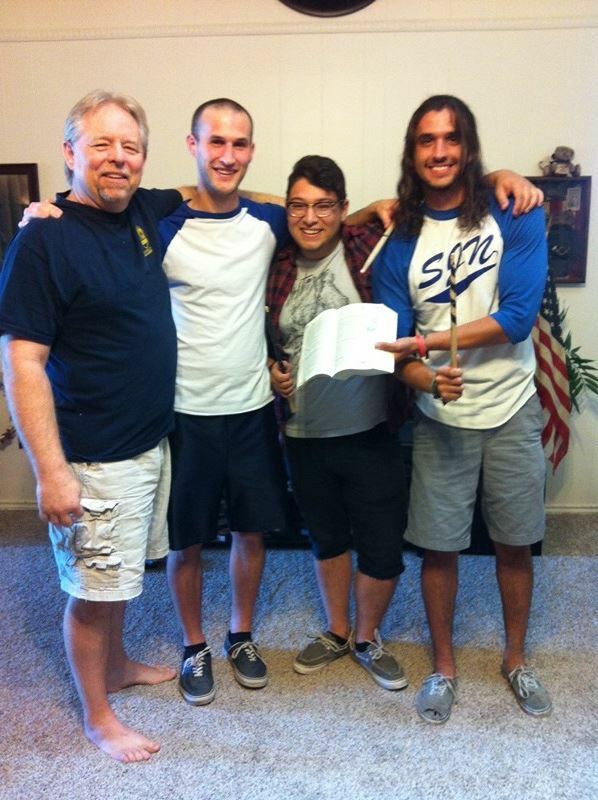 These awesome young men came by our house a couple of Saturdays ago just to visit and get caught up. (We tend to forget that, in addition to us dealing with the loss of a son, Jordan had so many friends who are still dealing with the loss of a friend.) We laughed together, cried together, remembered together. It was magical. While we were visiting, Cory asked, “Do y’all still have that Bible?” Michelle and I asked, “What Bible are you talking about?” The guys then described how, at one of their concerts, they were playing a song about the power of Christ…..in a “musical language that the average speed metal/hard rocker could understand.” In short, they were playing like a Christian version of Rage Against the Machine. Cory continued…. …..so, in the middle of the song (this was planned) Jordan LEAPS out from behind the drums (literally, OVER the bass drum) and begins screaming a passage out of Exodus about the “10 plagues”. Well, while Jordan’s reading (think: screaming the words of Scripture over the so-loud-it’ll-take-paint-off-the-wall guitars), he gets elbowed (accidentally) by someone in crowd and gets his nose broken! BUT JORDAN JUST KEEPS PREACHING! And bleeds all over the pages he was reading. This was the very first time Michelle and I had heard this story. Michelle quickly began looking for the Bible…..and found it! 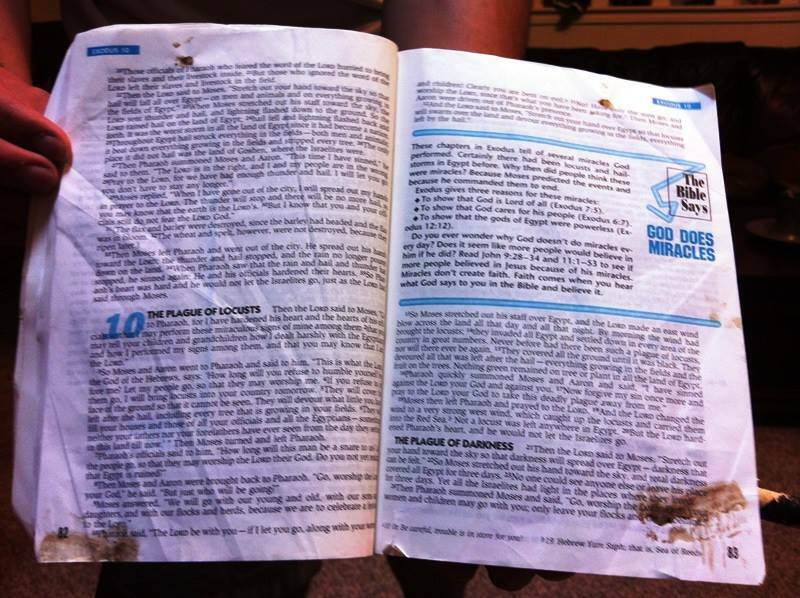 The stains you see on the pages of the Bible in the 1st pic is Jordan’s blood – shed while he was reading a story that foreshadowed the shedding of Christ’s blood. For obvious reasons, this Bible is very special now. And, we joyfully gave it to the guys in the band.